All of our applications, both web and mobile, are integrated with Google Analytics. Analytics collects and measures all activity to your applications. The resulting reports and analyses created by Google become a valuable tool for measuring traffic, for business and market research, and to assess and improve the effectiveness of your applications. 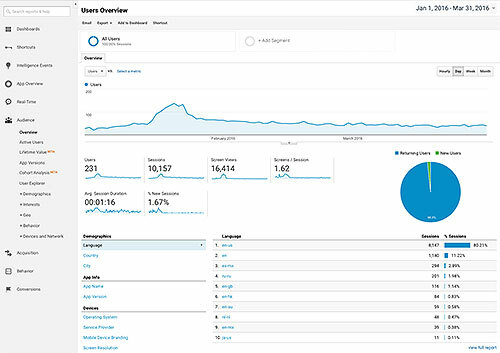 Quick "at a glance" statistics are available on the Pride Labs CMS at any time; you are also given full access to view the detailed reports on Google Analytics' website. Google Analytics provides an in-depth breakdown of visitors to your applications. This data is invaluable when it comes to tailoring content to a niche audience, or when advertising to areas of your implementation that generate the most significant portion of your traffic. Analytics displays how traffic moves through your application via a visual flow chart. Knowing which screens or pages are most visited allows you to modify your content to allow easier navigation to those areas; it also helps you know which areas of your site or application need improvement. Not only does Google Analytics offer hundreds of data points and reports that you can monitor, but you can also easily create custom reports of whatever data you would like to see. And their reports allow you to view historical data to track any potential trends across certain time periods.